Owning a car is expensive, over $8000 annually. We created Getaround to help owners like you make the most of your car. By sharing your car, you can turn your depreciating asset into a paycheck. The math speaks for itself. Let’s run through the numbers to see how much your car could earn. We’ll break down the earnings for some of the most popular types of cars shared on Getaround – standard sedans, compact SUVs, pickup trucks, and luxury convertibles. Keep in mind that the numbers we provide above are based on a sample of vehicles shared on Getaround. These cars are available for sharing 50% of the time or more and are rented at least the average number of times for that vehicle type each month. Estimating what your car will earn each month is pretty simple. The more days per month your car is rented, the more you’ll earn. Keep your car’s calendar open to boost your earnings. Other variables that also affect your car’s earnings include your car’s hourly rate; the market value of your car; demand in your area; and seasonal fluctuations in travel. Like most of the travel industry, part of Getaround’s business is seasonal. 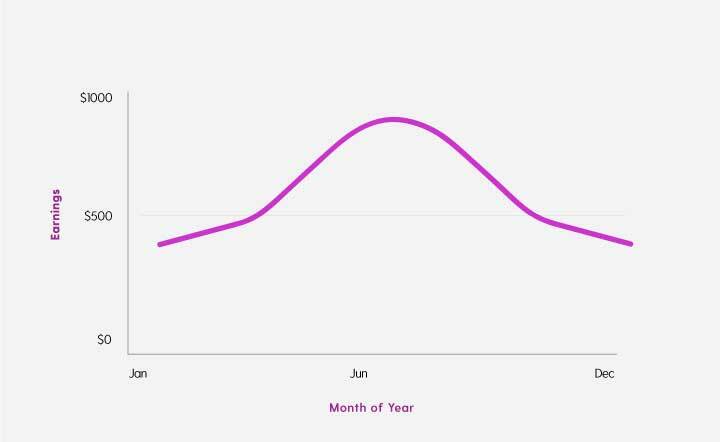 When you factor in seasonality, you’ll notice that your earnings peak in the summer months and dip slightly in the winter months. There are lots of ways to maximize your earnings even in the off peak season. By optimizing your car’s availability and price, your car could even pay for itself. From college tuition to vacations, your car has your best interests in mind. We also guarantee peace of mind. From our $1M insurance policy to 24/7 customer support, we’ll be right by your side the entire journey. Questions? Call us at (866) 239-4084.